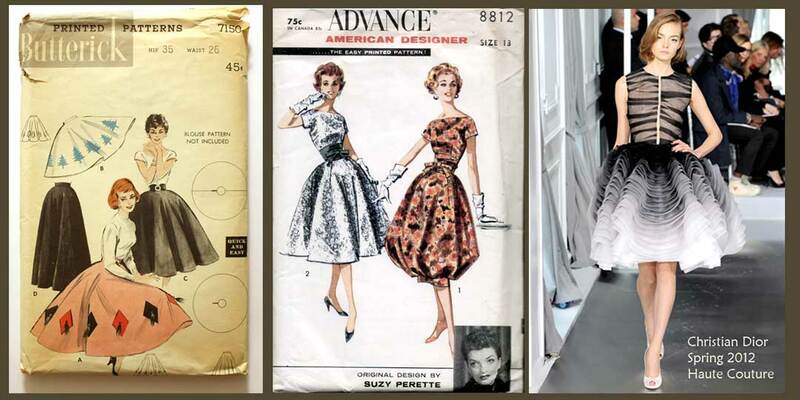 Circle skirts have been around for a long time, and they were a particular staple in the ’50s. The iconic poodle skirts are simply donuts of fabric where the inner circle is the waist band and the outer circle is the hemline. 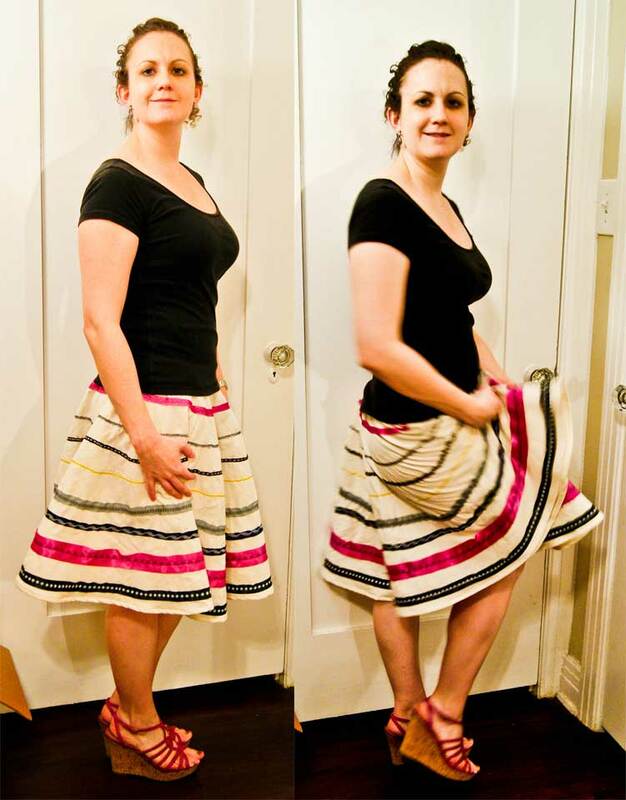 Below are some then and now pictures of circle skirts. If you want a bit of real inspiration, check out the Christian Dior Fall 2008 Paris couture show. No one does a wasp waist like the House of Dior. You don’t need a commercial pattern to make a circle skirt, which means yours can be custom-made to your measurements. Before we get to the nuts and bolts of cutting and sewing, a basic geometry review will be helpful. You have two circumferences to consider: your waistline and your hemline. Once you figure out your waist radius, the hem will naturally follow. I’ll be sketching out two scenarios for two different skirts. The first (this post) is the traditional full circle skirt; if you make it very short, you will look like a cute French maid. If you make it long, you will need a LOT of fabric. Keep in mind, the fuller the skirt, the shorter it LOOKS even at knee length- you’ve got a lot more fabric to worry about in a stiff breeze with a circle skirt than you do with a pencil skirt. The second skirt, (my next post), will have about half the fullness. 1. Measure your waist, or wherever you want your skirt to sit. I want my skirt to sit right at my belly button, which is 34”. Now add 1.25”- this gives you 2 5/8” seam allowances so you can close the skirt. That means my waist circumference will be 35.25”. 2. Now you need to figure out your radius. Plug into your trusty calculator: your waist circumference then divide it by 6.28. (Review the equations above if you need to). 35.25÷6.28=5.6 My inner radius is 5.6” (I’ll just round to 5 5/8” to make it easy). 3. Next, figure out how long you want your skirt to be, and add 1” to that for your hem. I want a 21” long skirt, so my next number is 22”. Now, add that to the first radius, and you now have the radius for the outer circle of your donut. Mine is 27 5/8” (=5 5/8″ + 22″). Keep in mind here that your hem circumference is 6.28 times this radius- this will be the fullness at your hem. Mine will be ~174” (=27 5/8 x 6.28). Just how big is that? More than 14’ (not quite 5 yards) all the way around, for a knee-length skirt on my 5’2″ frame. 4. Now you can figure out how much fabric you need. 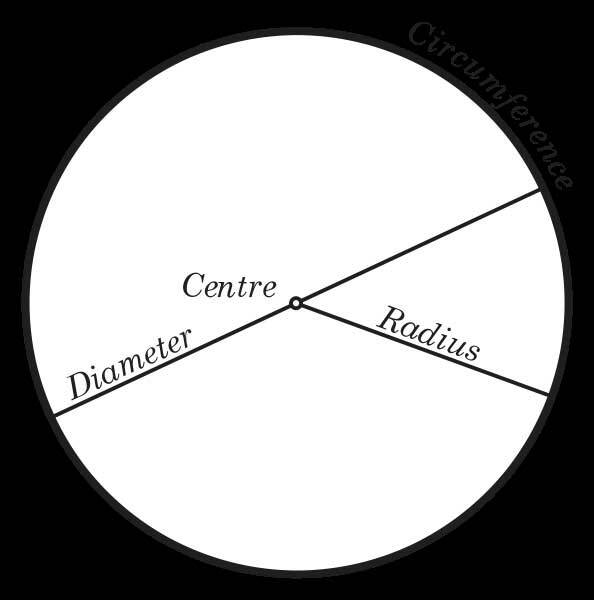 If you multiply your outer radius by 2, that gives you the diameter of your whole circle of fabric- how big your circle will be from one edge to the other. My diameter is 55.25” (=27 5/8″ x 2)- that means I have to have fabric that is at least 55.25” wide to get this cut out in one piece. Since standard apparel fabric widths are 45”, 54”, and 60”, I will need to choose the largest width. And I will need 55.25” long (just over 1 ½ yards, though I’m going to round up to 1 ¾ yards- you’ll see why in the next step). Sewing in circles presents one primary challenge: to make a hemline and waistline, you have to turn one edge of the circle in on itself, aligning a smaller circle with a larger circle, which can have you ending up with puckering. You have two options for your waistline- you can turn a very narrow seam so that the difference between the inner and outer circles isn’t so big that you have to worry about puckers. Unless you proceed carefully this can unfortunately scream, “8th grade home ec project” with a visible seam at the waistline. Instead, I recommend that you cut a second donut of fabric that will serve as an inner waist band- this will add a bit of structure to the skirt, allow your waistline to appear seamless from the outside, and strengthen your zipper seam. 5. Your waistband doesn’t have to be perfect because no one is going to see it- just start with the radius for your waist and cut a second donut- about 3” wide. This is why I needed a little more fabric at the end of step 4. If you are lining your skirt, skip the waistband and cut a full second circle. 6. Using all the numbers you’ve collected, you can either draft your circle directly onto your fabric, or make a pattern piece. I’m going to make a pattern because, hey, I may want to make more than one skirt, and who wants to reinvent the wheel every time? I’m going to make my pattern piece ¼ circle because I plan on folding my fabric before cutting out the skirt. Starting with a quarter-circle makes things easy because the center of your circle will rest on a 90° angle. 7. Pin and cut your skirt and waistband. Oops! First lesson learned (far right picture in the series below): Align your pattern edge with the folds, not with the selvage. Otherwise, you will end up with two pieces (and an extra seam) rather than just one! If you make this mistake, just sew up one of the seams- you can worry about fit in a few minutes. 8. Think about any embellishments you may want to add at this point, while the fabric is still flat. I decided to make this skirt a sampler of sorts- I have a TON of ribbon laying around left over from my ventures to the Offray ribbon outlet in Hagerstown, MD. I also have an exceptionally fancy sewing machine that has a bunch of decorative stitch options that I never use. So, I put the two together and attached 9 horizontal rows of ribbon to my muslin using various stitches. If my calculations are correct, I just sewed almost 26 yards of ribbon and decorative stitching. It took 3 sessions to get it done- I don’t recommend this embellishment if you are short on time (or patience or thread or ribbon)! 9. With a 5/8” seam allowance, attach the waistband to your skirt. I always like to understitch this seam to keep the fold-over nice and neat. 10. Do a quick fit check- If you spent some time embellishing, there is a good chance your fabric has stretched some. Also, since your waistline is a circle of fabric, a portion of that circle is on the bias, which means it has more stretch than other parts. The skirt may be an inch or two bigger than you want it to be- you’ll want to check the fit now, before you install the zipper. I ended up cutting about 4″ of width from my skirt. 11. Do whatever you want to close the last seam. For this skirt, I’m going to install a 9” invisible zipper following the instructions that come with the zipper. Nothing too special. 12. The hemline presents the same problem as the waist. For this, I recommend as narrow a hem as possible. 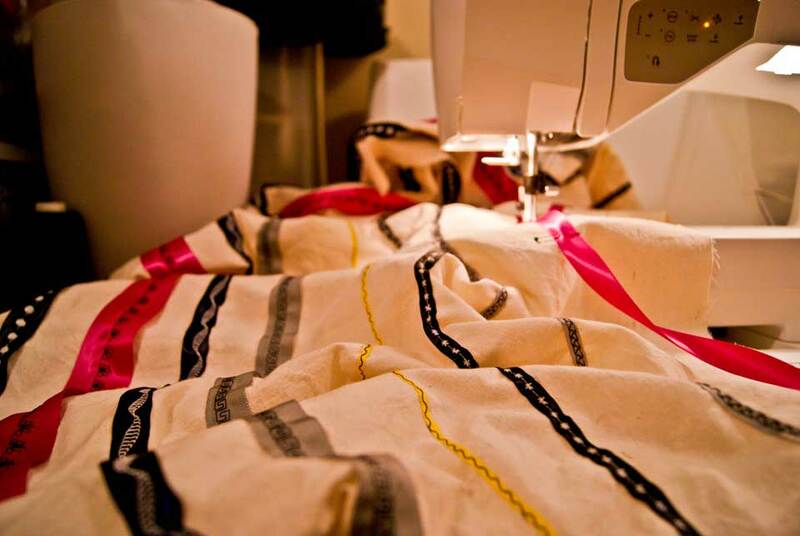 First, do a zigzag or overlock stitch all around the bottom of your skirt. This serves two purposes: these stitches offer more flexibility than a straight stitch, which you will want when you turn it under; the zigzag will help reduce fraying; finally, the zigzag defines an easy, narrow area for you to turn under and stitch. As you run this stitch, make sure you don’t pull or stretch your fabric at all. 13. Head to your ironing board, and turn under the zigzag. You can probably get away with just once, but I’ll turn mine under twice to totally enclose the raw edge. Press really well so you don’t have to worry about pinning the hem (that would be 14′ of pinning, which I think is excessive). Steaming while pressing will also help manipulate the fabric so what you are turning under (larger circle) fits the skirt hem (smaller circle) without puckers or gathers. 14. Sew the hem. If I wasn’t so tired of all my decorative stitches, I probably would have used one here as well. 15. Finish up with any embellishing you want. I really thought that I probably wouldn’t like my skirt much at all when it was finished, but I put it on to take the pictures and I just felt FUN, pretty much immediately. I am very, very tempted to make a new circle skirt for every season. We’ll see just how much I wear this in the Spring & Summer. My ultimate conclusion is that subtlety is lost on a circle skirt- if you are going to wear a garment designed to make your waist look tiny by making everything immediately below it look enormous- just go for it! If you use a fabric with some stretch, you may be able to avoid a zipper altogether. 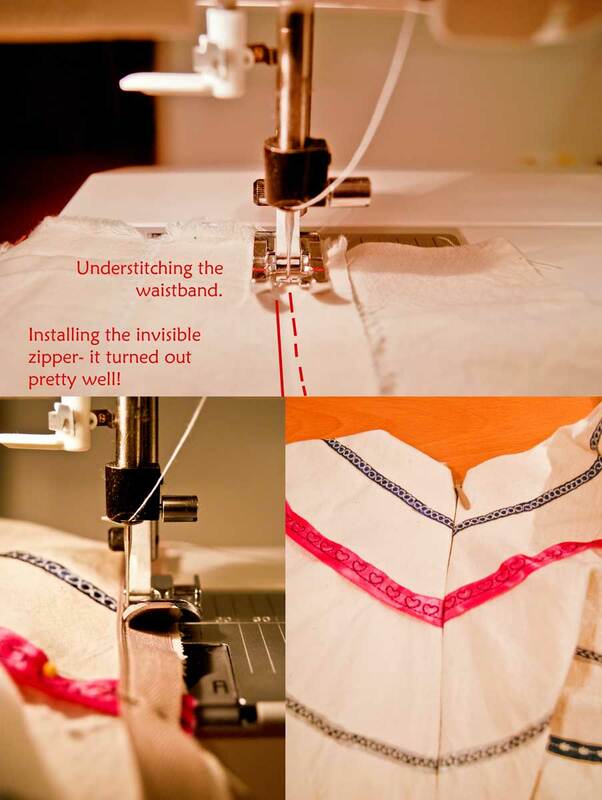 This is one of my very favorite sewing shortcuts! You will probably want to cut your waistband on the cross-grain to prevent sagging. 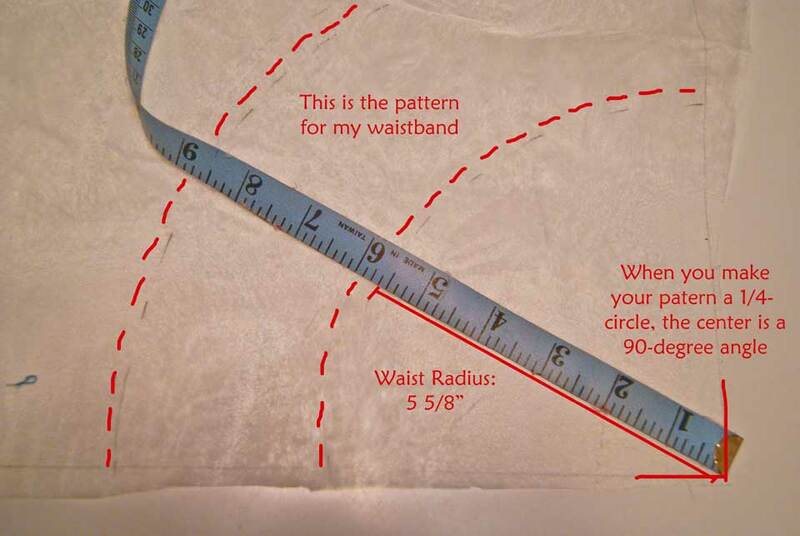 If you really hate zippers and don’t want to use stretchy fabric, measure your hips (or wherever the widest part of you is that the skirt has to go over) and use that circumference to figure out your inner radius for your skirt and waistband. Then cut a piece of elastic to fit snug at your waist (tip: the wider the elastic, the less likely you are to get a little muffin top). Enclose the elastic between the skirt and the waistband, and voila- easy skirt with no zipper! Using this technique, the length shouldn’t change, but you will have a much more full skirt. If you want to use a sheer fabric, use the same circle pattern to cut out your lining, sew the two pieces together at the waist and you don’t have to install a waistband. You can, of course, line your skirt even if you don’t use sheer fabric. Using a sheer fabric is a nice way to trick people into thinking your skirt has much less body than it really does- it also gives you some different options with any embellishing you may have in mind. Do you like ruffles? If you have extra fabric, cut out a few progressively larger donut circles. Finish the edge of the outer circle however you wish, and run a long basting along the inner circle. Pull the ends of the basting seam to gather the edge to fit to the skirt, and attach. If you want a slip to make your circle skirt authentically full-bodied, construct a second circle skirt an inch or two shorter than your finished skirt. Most commercial slips are made from tricot, but if you don’t have any on hand, you can use just about anything that won’t show through. If there’s no stretch, use the method outlined for the elastic-waist skirt above, but use thinner elastic at the waist (¼” to ½” should work); you can attach the elastic directly to the fabric using a zigzag stitch and skip the waistband entirely. Gather a length of inexpensive tulle until you achieve the fullness you’re looking for, and sew it to the hem of your slip. If you want to be extra saucy, make your slip as long as your skirt, choose a contrasting color of tulle, and let it play peek-a-boo with the hemline of your skirt. Do you want a bubble skirt? Make a second circle skirt a few inches shorter than your outer one, and sew the hemlines together. The hem on the outer skirt will be wider than the hem on the inner one, so you will have to do some gathering. Then, attach the inner skirt to the waistband- you may have to do this by hand if you don’t want a visible seam on the inside of the skirt. Also take into account that this method shortens the length of the outer skirt- you will have to adjust to make up for it. For extra pouf, sew a ring of tulle around the bottom of the inner circle so it is enclosed between the two skirts. Try out alternatives to invisible zippers for closure- buttons, an exposed industrial zipper, hooks and eyes, buckles, snaps, grommets & corset-style ties, heck- why not Velcro? (but not adhesive-backed- your sewing machine will hate you forever). If you start with a larger inner-radius, you could also make this into a wrap-skirt. Or cut it in half to make an apron. Use ribbons, buttons, and appliqués to embellish your skirt to your heart’s content. Consider free-style doodle stitching or a cut-away appliqué technique. I collect pictures of details from fashion shows that I like, and try to incorporate them into my own projects whenever I have a chance. 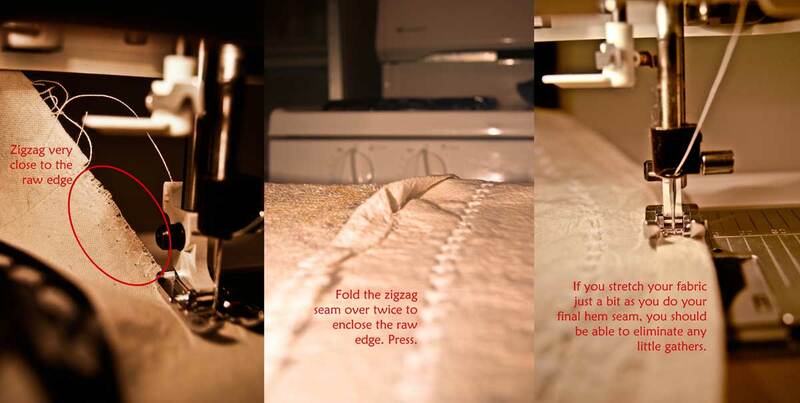 Be proud of your perfect seams and topstitch everything in sight using contrasting thread. If you get to step 4 and figure out that your total diameter is wider than your fabric allows, you will need to cut your skirt in two or more pieces, from multiple pieces of fabric. You could get very technical and figure out new dimensions accounting for a second set of 5/8” seam allowances, but that might be overkill. Just cut your two pieces using the original pattern and sew the sides using a narrower seam (like 3/8”) or use the standard 5/8” seam and it may sit a bit higher on your waist. If you do want to recalculate, your new circumference is your waist + 2.5”. so R= (waist + 2.5) ÷ 6.28. If you want to cut your skirt in 4 pieces, the equation is R= (waist + 5) ÷ 6.28. Essentially, every piece carries a 1.25” seam allowance, so one piece adds 1.25”; 2 pieces adds 2.5”; 4 pieces adds 5”; 8 pieces adds 10”. A circle skirt using 8 pieces of contrasting fabric would actually be a pretty cute and easy way to use up remnants! AND- if you have at least two seams on your skirts, you can put in POCKETS! I wish I had thought of this earlier while I was making my skirt. If you play around with the radius of your outer circle, you can create a scalloped (large-scale) or tulip hem. Start out with a 1/4-circle pattern, and for the outer radius, make that a half-circle (smaller radius) instead of a quarter-circle. this will give a clover effect at the hemline. This method works as well for children and teens as it does for adults. Make matching skirts for your daughters, nieces, and friends! It could be a neat geometry lesson for you home-schoolers, or a slumber party craft idea. Send me pictures of your finished projects and I will post them in the Gallery! Holy wow is that a cute, detailed skirt! I think i love everything about it! i had never thought about ribboning! Thanks! The ribbons were partially inspired by the Party Like a Puppet dress, partially inspired by “Holy crap I have a ton of ribbon”. Love the skirt! Only wish I knew how to sew. It would be so cute to do matching ones for the girls and I for Easter Sunday. Schedule some lessons with Mom- this is an easy starter project, especially if you go with an elastic waist. And if you get fabric remnants at JoAnns, it’s 50% off! And I bet Mia and Shelby would love decorating their own skirts! How would you add grommets? do you need an extra facing?